Daredevil #2 Cover. 2011. Ink(ed by Joe Rivera) on bristol board, 11 × 17″. Phew. I'm done. The first 3 issues of Daredevil are out of my hands... which means I can finally go outside. And answer all the email I've been putting off since March (sorry, internet). First of all, I have to thank my Dad, who (aside from the legal obligation of supporting his offspring and teaching me how to draw ellipses) embarked on a new career in order to bolster my own. I don't know many dads who will drop everything and ink their kid's superhero comic. As far as I know, there is only one. Thanks, Dad! Daredevil #2, Pages 2-3 detail. 2011. Ink(ed by Joe Rivera) on Marvel board, 11 × 17.25″. As for the rest of DD team, they may not have coached my basketball team or made my pinewood derby cars, but they're still the best in the business: Mark Waid (writer), Steve Wacker (drummer), Ellie Pyle (editor), Javier Rodriguez (colorist), Joe Caramagna (letterer). 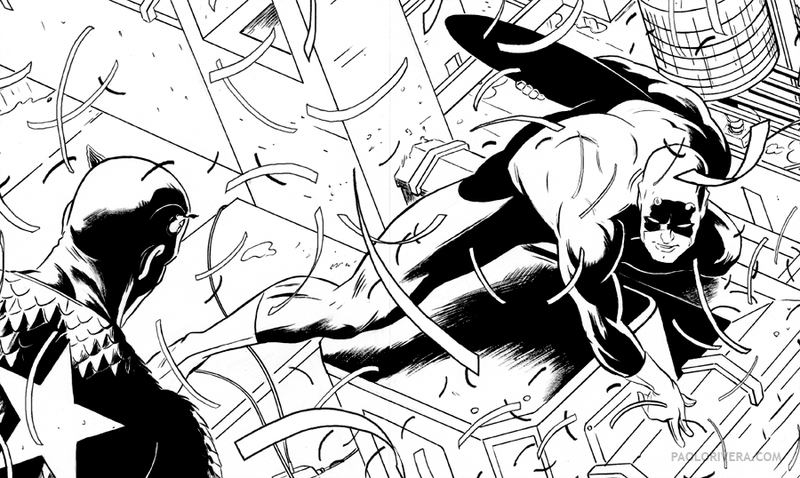 You'll have to wait until September to see a full issue by Marcos Martin, but it will be well worth it. I have been a fan of his work since I first saw it and am honored to be part of his tag team. 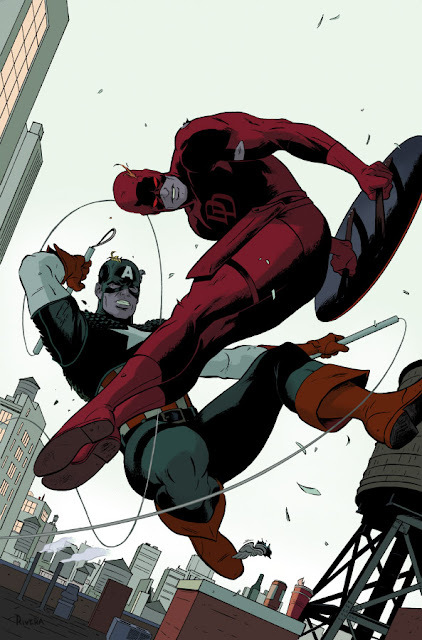 As for the story, Waid is doing some amazing things with Daredevil and it's a dream to work with him. But one thing I must say: he is evil (I have evidence). He has fooled everyone into thinking that we're going easy on Daredevil. That should get cleared up by issue 3. A huge thanks must go out to my girlfriend, April, who has kept me well-fed, bathed, and presentable throughout the project... a little too well-fed, as it turns out. Time to start going to the gym again. If you haven't heard, we were the #6 book last month, so thank you to everyone for the support. The next issue, which debuts this Wednesday, will be a buck cheaper at $2.99. And finally, I hope this marks the return to regular blogging. I think I'm going to shoot for twice a week from here on out, which means the return of Wacky Reference Wednesdays. You've been warned. Does the two super heroes in the drawings have the same face and the only different is the mask? Since Victor Gischler forced me to start buying Marvel Comics again, I figured I might as well give your new DD comic a shot. Am I glad I did. Great job by all involved, and you guys knocked it out of the park when DD kissed the bride. Best comicbook scene in DECADES. Thanks so much, Groovy Agent! We need more people forcing other people to read comics. This issue is Awesome!! I loved the fight between DD and Cap. I really like how DD gave himself the victory in the end. I'm really digging your dad's inks on this. I can't wait to see what's in store for DD in the next issue. Keep up the great work. Thanks! It's always a treat to draw 2 of my favorite characters (and Waid's as well). As soon as I read that Stradivarius line in the script, I knew it was going to be a classic. Issue 3 will be out in less than 3 weeks. It's nearly one giant action sequence... and my Dad's favorite so far. I finally got my hands on an issue of this series! When I went to buy the first, they were all bought out! I just snagged this issue and I think your art is incredible. From the real world rooftops to the insanely inventive stuff toward the end, it shows real technique. Keep up the awesome, sir! Thanks, Phillip. Glad to hear the first issue sold so well. And now they're even doing a reprint. Will do my best to keep up the momentum.